Seminole County DUI Lawyer – While the facts of this case are from a different state, the DUI laws in Florida allow for a DUI arrest and subsequent conviction under similar facts….. A 49 year old man in Illinois has been arrested and charged with a DUI and he wasn’t even driving his car. 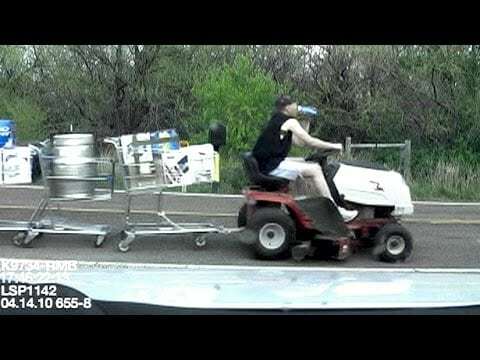 His license had been revoked due to a prior DUI conviction and he decided that rather than take public transportation, ask a friend for a ride or walk, he would take his riding mower to the nearest gas station for some beer. To make matters worse, the man was riding his mower on a public road while drunk. Police were notified by witnesses that the man was weaving in and out of traffic on the riding mower. Police tried to stop the man, but he drove into his front yard reportedly spilling Milwaukee’s Best along the way. He is now facing a second DUI charge and bonded out on $10,000. While this set of facts is somewhat humorous, a DUI charge in Seminole County is not. If you have been arrested for a DUI in Seminole County, Florida, you will need experienced DUI legal representation. I am a former Seminole County DUI prosecutor with over 20 years experience defending cases just like yours. My DUI defense firm is A+ rated by the BBB and offers free initial case evaluation. We represent clients in all Seminole County cities including, Altamonte Springs DUI, Oviedo, Winter Springs, Sanford and Casselberry. To schedule a free consultation, please contact the experienced Seminole County DUI defense lawyers at Tilden Law at 407-599-1234.